Introducing popular tourist attractions in Shibata-machi, Miyagi Prefecture. 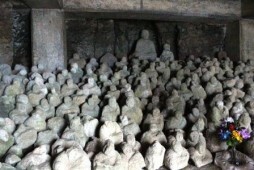 In the old days when a plague was raging the area, a monk called Doichi Kanchu chanted the sutra while carving these stone statues. This 450 year old wisteria has been designated a natural monument for Miyagi Prefecture. These two wood statues were carved using the Katsura tree in the Muromachi period (1336 – 1573). 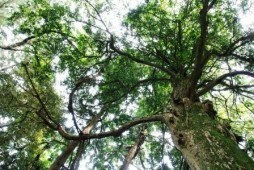 These have been registered as a designated cultural property in Miyagi Prefecture. 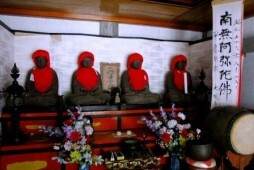 Four iron statues of about 82 cm in height enshrined at Daikou-in temple. 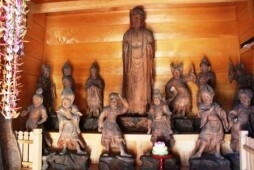 These have been registered as a designated cultural property in Miyagi Prefecture. 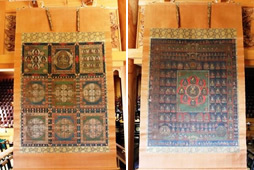 These are pictures (157.9cm x 129.7cm) from the Nanbokucho period (1336 – 1392) that have been registered as designated cultural property in Miyagi Prefecture. 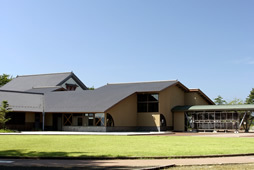 These pictures are shown to the public twice a year on exhibition day at the main hall. 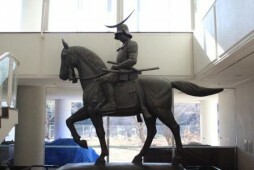 This is a 3/4 sized replica of a statue of Date Masamune on a cavalry horse that was erected at Aoba Castle. 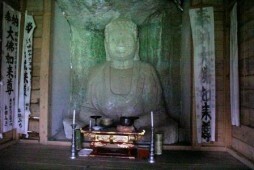 Where the tuff of Iwasaki mountain in the Tomizawa district is eroded, there is a Amidanyoraizazo of 2.5 m in height as well as several stone Buddha from the late Kamakura period (1185-1333), and the thirty-three kannon that were carved in the Edo period (1603-1868) cover the hillside. Seeking a fulfilling meeting of people and nature, this natural recreation village was opened in 1976. Play on the vast 4 hectare lawn. In autumn you can enjoy yam cooking festival and other such seasonal events, and is lively with family and groups throughout the year. The majestic view of the Zao mountains and the Pacific Ocean is absolutely the best. Amago district in Irimada, Shibata-machi, thought to be the most northern point that yuzu can be grown. 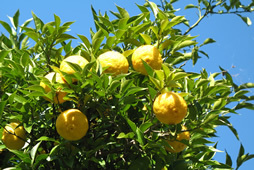 The yellow fruit that can be picked from a 7 to 10 meter tree that is estimated to be about hundreds of years old, has a reputation for thick rind and good fragrance and makes the surrounding air refreshing. 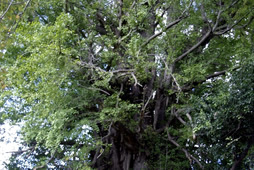 Located in the middle of Atago mountain, this Ginkgo tree 31 m tall, the trunk circumference of 11 m and branches spreading 14 m to the east, 12 m to the west, 11 m to the south and 13 m to the north and estimated to be 600 years old, is a male plant. 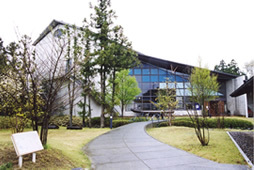 The document exhibition hall "Shigenkaku", industrial exhibition hall, and tea room "Joshinan" and such comprise this museum, and this museum collects, preserves and exhibits regional history and folklore. 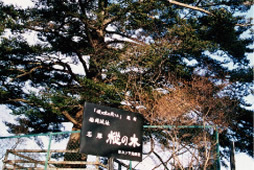 This is the location where the estate where Shibata lived until the Meiji Restoration, and is famous for having the leading cherry blossoms in the Northeast. 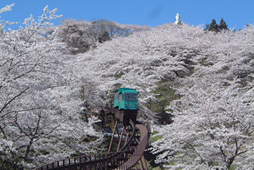 There is a 24 m standing Funaoka Peace Kannon on the summit and a panoramic view of the whole town of Shibata as well as the Zao mountains and the Pacific Ocean.